HomeDenial and Delay: Tips on Detecting Global Warming B.S. Denial and Delay: Tips on Detecting Global Warming B.S. Many of those who deny that burning fossil fuels is altering the climate work diligently to confuse and delay action that would in reality benefit nearly all of us. These professional deniers and their followers can be convincing, citing well-known experts and twisting their views and findings. So here’s a couple of common sense tips to add to your BS detection system. 100,000 repetitions or variations of a lie is still a lie. A reader recently told me global warming is really caused by variations in the sun’s activity. His proof was a “science” article from Investor’s Business Daily that said this was the conclusion of the Max Planck Institute for Solar System Research, a well-known research centre in Germany. A quick check of the Institute’s website revealed their actual conclusion: “Solar activity affects the climate but plays only a minor role in the current global warming.” See for yourself: it’s in English and still posted on their website. Denier Tip # 2: Follow the money. Who benefits from denying climate change? Among many others, journalist Ross Gelbspan has documented the money trail from the automotive and fossil fuel industry to various right-wing organisations and institutes in his two books, “The Heat is On” and “Boiling Point”. 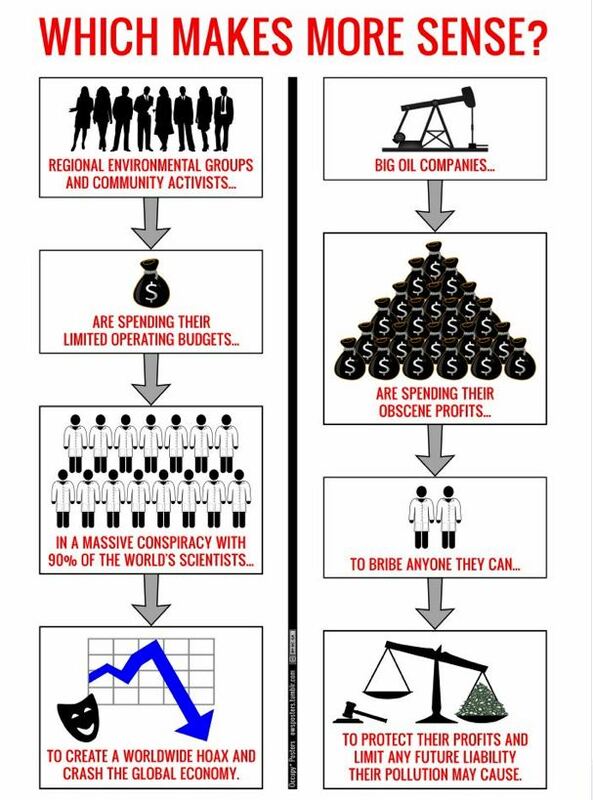 Ask yourself how climate scientists benefit by concluding that humans are inadvertently changing their climate? Deniers often allege they get grants to do research on climate change. Yes they do, but they could also get grants to research water pollution or the ozone layer. When scientists conduct research, they are simply asking questions about something and then trying to find answers. They don’t really care what the answers are. They are what they are: Humans are changing the climate. Scientists are smart people. If they really wanted to make tonnes of money, they’d work on Wall Street, wouldn’t they? See Last March of the Global Warming Denialists for more on this. I think these denialists are part of the old Flat Earth Society. I think maybe it’s best to ignore them. But then again, as a reporter, you must set the record straight. Thanks, sir! btw, that headline in the IPS news was great. Another good metaphor for the climate debate. The Ostrich Brigades, sigh. Whoever writes those headlines deserves some kind of prize for good wordsmithing. “Follow the money” has to work both ways. There are economic entities that stand to benefit from global warming. Their support for GW research has to be scrutinized as closely as Exxon’s support for the “denial” camp. Scientists around the world who have done climate research for the past 25 years get their funding almost entirely from government and universities, not from solar cell or wind machine manufacturers. And real scientists provide proof – evidence, measurements etc — that is then published in science journals for all to see. Denialists do not, they criticize, offer wild theories and rant endlessly. I know two characters who are in denial about AGW. One has a degree in geology but long term unemployed with no intention of disrupting his bludging lifestyle, the other doing his PhD in cell biology. Both are ant-fem, ant-jewish, anti-colour, attribute cultural achievements of non-anglo saxon cultures to alien intervention and, not surprisingly pro-nazi. Hardly a scientific sample but I’ll bet not uncommon.